The Crawford Fund’s Queensland Committee last year announced the recipients of their inaugural 2015 Crawford-in-Qld Student Awards. These awards are intended to facilitate active student participation in international agricultural research projects and to help young agricultural scientists gain valuable international experience and expertise. 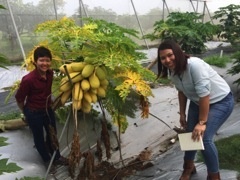 Crawford-in-Qld Awardee, Mai Nantawan from Griffith University, spent time earlier this year training in tissue culture technologies of papaya in Taiwan. 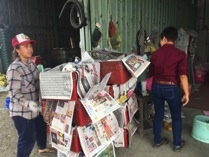 She has now delivered her report entitled ‘Report on tissue culture technology training in Taiwan for large-scale production and research of papaya’, a short summary of which is provided below. Papaya is becoming popular in the global market—it is ranked in the top five of tropical fruit crops worldwide and is an important fruit crop in Australia, particularly in North Queensland where 94% of Australian papaya is produced. 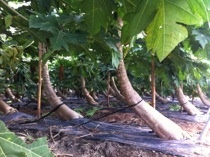 A major concern of the papaya industry is currently papaya ring spot virus disease (PRSV-P). The disease causes inconsistent eating quality of papaya fruit and is a major limitation on the expansion of the papaya industry worldwide. 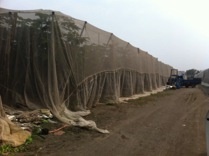 In Australia, papaya tissue culture techniques have been developed to produce elite lines for papaya breeding programs. The use of micropropagation is providing virus-free plants, rapid production of uniform seedlings and consistent quality of fruit. The large-scale production and commercialisation of Australian papaya tissue culture are still under development. Many studies have reported some problems associated with papaya micropropagation, which occur at different stages of the life cycle. These include high contamination rates, unreliable establishment of shoots, poor root production and low survival rates. 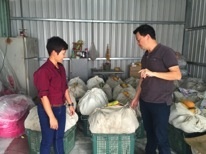 The varied success rates are likely to be due to different varieties/genotypes of plants, the growth stage of plant materials and the applied techniques. 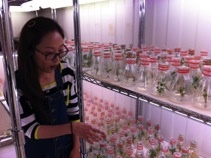 As part of her award, Mai participated in a training program to learn papaya micropropagation techniques at the National Chung Hsing University (NCHU) in Taichung, Taiwan. During her stay, she also visited agriculture research stations and papaya farms to gain an understanding of papaya production in Taiwan. 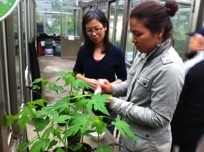 Expanded papaya research collaborations on PRSV-P resistance and papaya breeding. Interested in participating in international agricultural research like Mai? The Queensland State Committee plan to announce the next Crawford-in-Qld Student Awards early in 2017, so keep an eye on our webpage for the details. In the meantime, both the Western Australia and New South Wales State Committees have launched their student awards. Click on the links, or visit the relevant State Committee pages for further information.